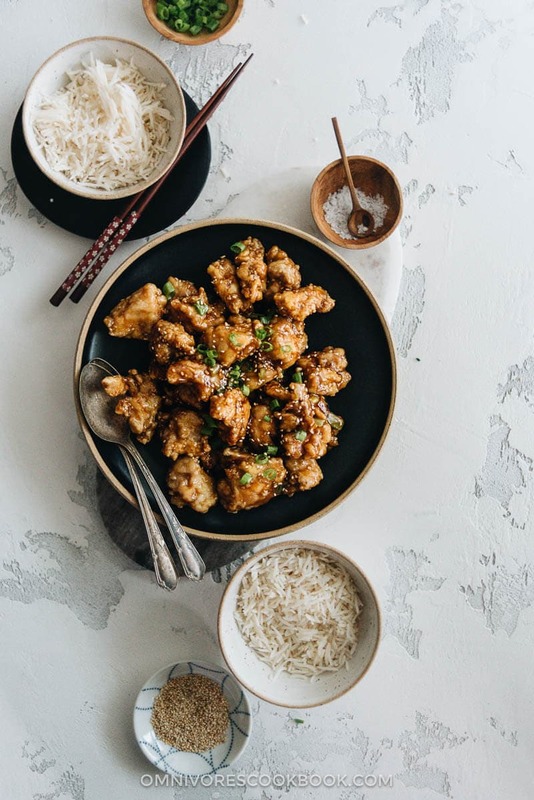 You typically see two types of sesame chicken recipes. 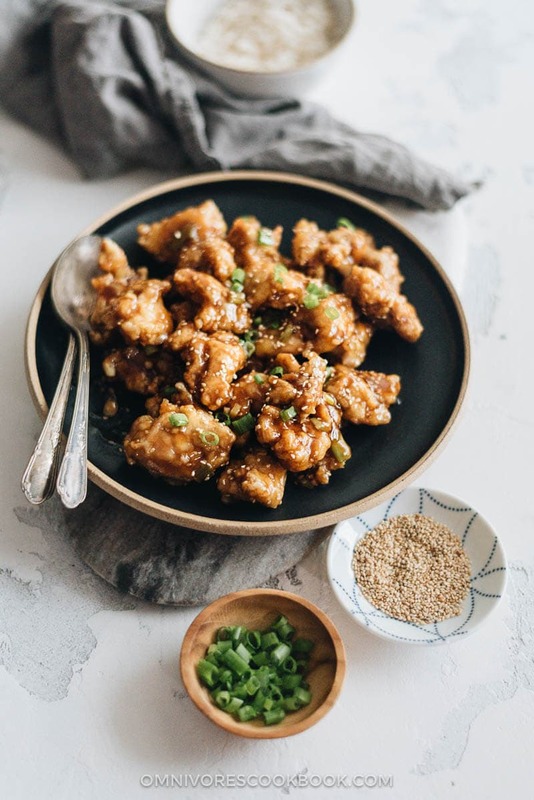 The first type replicates the takeout-style crispy sesame chicken but requires you to deep fry the chicken. The second type uses a simple stir fry approach, but doesn’t give you that crunchy surface. This recipe provides a better solution, so you can create the perfect crunchy, crispy chicken without deep frying. 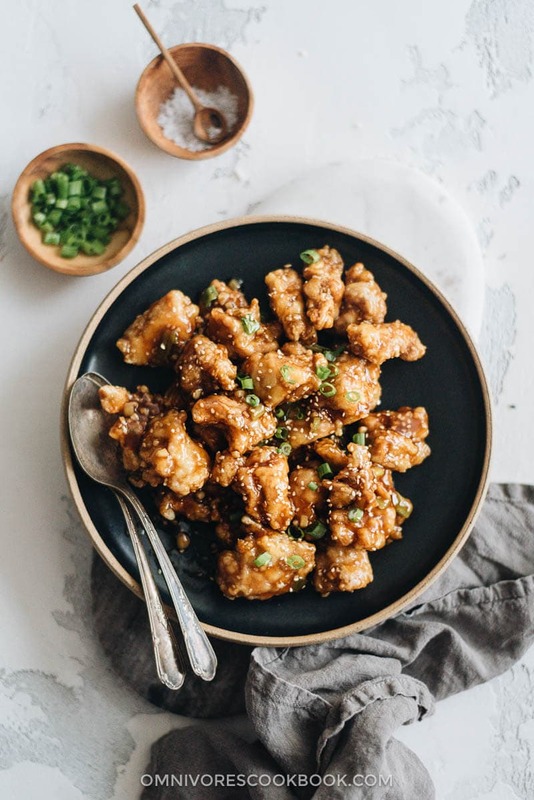 Now here is the trick to creating crispy chicken with a crunchy coating that is like the takeout you’d get from Chinese restaurants, without making a mess. The killer coating for extra crispy chicken. Not only does it season the chicken and make it flavorful, but it also yields an extra crispy exterior, even after you coat it with sauce. You can use any cut of chicken you like. Although I always prefer chicken thighs, you can use chicken breast and create awesome results, as well. How to make crispy chicken with less oil. The answer is by pan-frying, which requires just 3 to 4 tablespoons of oil to coat your skillet. Simply cook the chicken one side at a time until golden brown, and transfer it to a plate for a minute to cool. Taste a piece of chicken. You’ll be surprised at the juicy and flavorful interior and super crunchy coating. Extra flavorful sauce with less sugar. 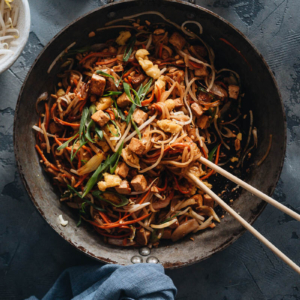 This recipe uses cooking wine, Chinkiang vinegar, and plenty of fresh herbs to create an extra fragrant sauce that is rich and delicious. Many recipes out there use half a cup (or a whole cup!) of sugar. This one uses just a quarter cup, but I guarantee the results will be amazing. 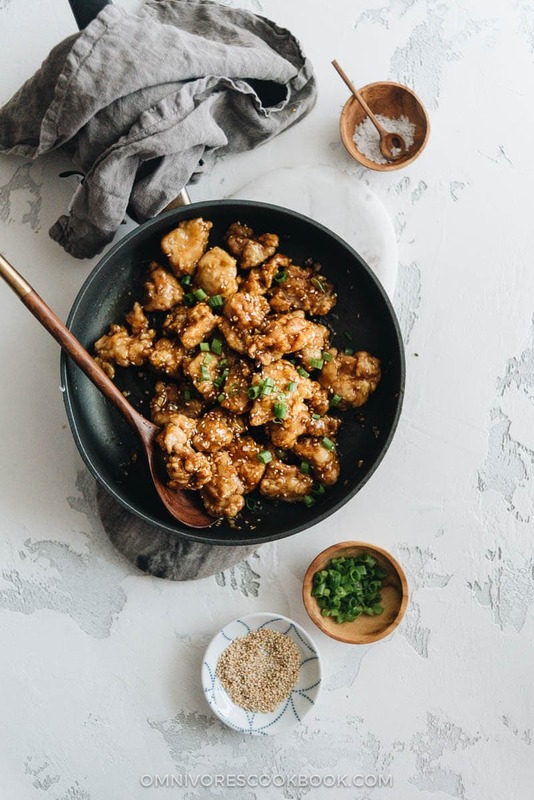 Ready to make some killer sesame chicken at home? Happy cooking and I hope you enjoy the dish as much as I do! 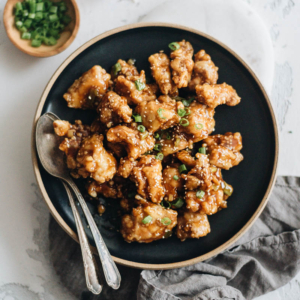 Make ultra-flavorful restaurant-style crispy sesame chicken without a ton of sugar or deep frying. Combine chicken pieces, vegetable oil, and salt in a big bowl. Mix well and let marinate for 10 to 15 minutes. Heat oil in a large nonstick skillet over medium high heat until hot. Add chicken all at once and spread out into a single layer in the skillet. Separate chicken pieces with a pair of tongs or chopsticks. Wipe the extra oil from the pan using a few layers of paper towel held in a pair of tongs, leaving about 1 tablespoon of oil in the pan. Add the garlic and green onion. Stir fry a few seconds to release the aroma. Stir the sauce again to thoroughly dissolve the cornstarch. Add the chicken back into the pan and pour in the sauce. Stir to mix well. Transfer to a plate and serve hot over steamed rice. Hello! This recipe looks really, good, but I think it might be missing a step? You have “Stir the sauce again” in step 6, but you don’t actually mention combining the sauce ingredients in the first place anywhere? I assume you just whisk all the ingredients together in a bowl and set aside until then, but I just wanted to make sure I wasn’t missing something. Thanks! At least once a week I try one of your recipes. This was a huge success and left us wishing there were leftovers! 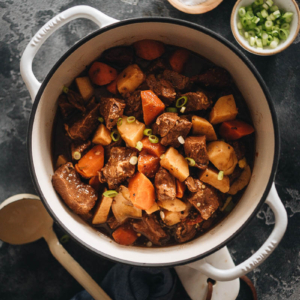 Thank you for sharing your wonderful recipes! Hi, great site! This looks delicious. Maybe you can help me – I’m cooking for somebody who isn’t eating eggs or dairy currently; is there a good substitute for the eggs? Thanks! Love Chinese cuisine and am a big fan of shallow frying, Will definitely try your recipe. Making this is superb! So delicious like I ordered it from a real Chinese restaurant…but I think much better. Will land in my favorites! Thank you. A quick question regarding Step 1, when you said ‘vegetable oil, do you mean sasame oil? Hi Jess, no, I usually use vegetable oil or peanut oil to make this dish and use toasted sesame seeds to add the nuttiness. If you want a more intensive sesame flavor, you can add a small drizzle (like 1/2 teaspoon) of toasted sesame oil (the dark type) at the end of cooking. 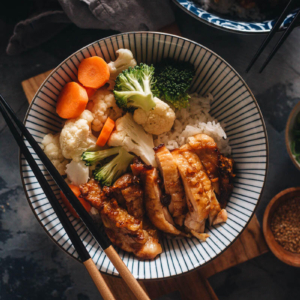 Adding sesame oil at the beginning of cooking is not the best option because the high heat during cooking will cause it to lose the nutty taste. Sounds delicious! I’m a type 2 diabetic – is there a way that I can avoid the sugar? Hi Robert, you can try to use 1/2 tablespoon stevia or 6 packets splenda to replace the sugar. The sweetness is very important in this recipe, otherwise your dish will turn out too sour. Hi Maggie! 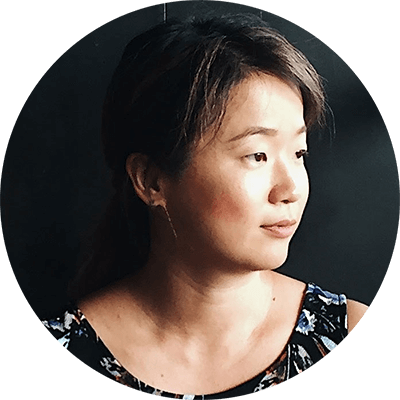 I am a huge fan of your blog! If I want to make this chicken the day before, how do I reheat it to get the crunchy flavour again? Would I bake it? Delicious and surprisingly easy considering the wonderful flavor! I willwith pork to make ,is ok? Hi Erika, yes, pork will totally work! Where have you been all my life? I am a former Beijinger (Lao wei) and I ‘ve missed these dishes!!! Thank you so much. I understand your methods clearly.